Huawei has launched Huawei Nova 3 in India which comes with Four AI Cameras, Notch Display & Kirin 970 processor. 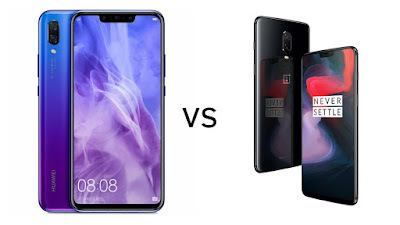 Check out Price, Specs, Features comparsion between Huawei Nova 3 and OnePlus 6. Both Phones comes with Glass body and has Fingerprint Scanner on the Rear. Nova 3 features a 6.3-inch Full HD+ 19:5:9 3D curved glass display whereas OnePlus 6 has 6.28-inch Full HD+ AMOLED display. Huawei Nova 3 is powered by Octa-Core Huawei Kirin 970 processor with 6GB RAM and 128GB Storage whereas OnePlus 6 comes with Octa-Core Qualcomm Snapdragon 845 processor with 6GB/8GB RAM and 64/128/256GB internal storage. On Camera Nova 3 has a 16MP rear camera with LED flash, f/1.8 aperture, PDAF, CAF, secondary 24MP rear camera and 24MP front-facing camera with f/2.0 aperture, secondary 2-megapixel camera compared to 16MP rear camera with dual LED Flash, f/1.7 aperture, Sony IMX519 sensor, OIS, secondary 20MP camera with Sony IMX376K sensor, f/1.7 aperture and 16MP front-facing camera on OnePlus 6. Huawei Nova 3 has 3750mAh battery whereas OnePlus 6 has lower 3300mAh Battery. Huawei Nova 3 is priced at Rs 34,999 sale from August 23.OnePlus 6 price starts at Rs 34,999 for 6GB RAM, Rs 39,999 for 128GB Storage with 8GB of RAM. Midnight Black color variant with 8GB RAM, 256GB storage cost Rs 43,999, OnePlus 6 Marvel Avengers Limited Edition is priced at Rs 44,999. Huawei Nova 3 comes with 4 Camera's, Bigger Battery.